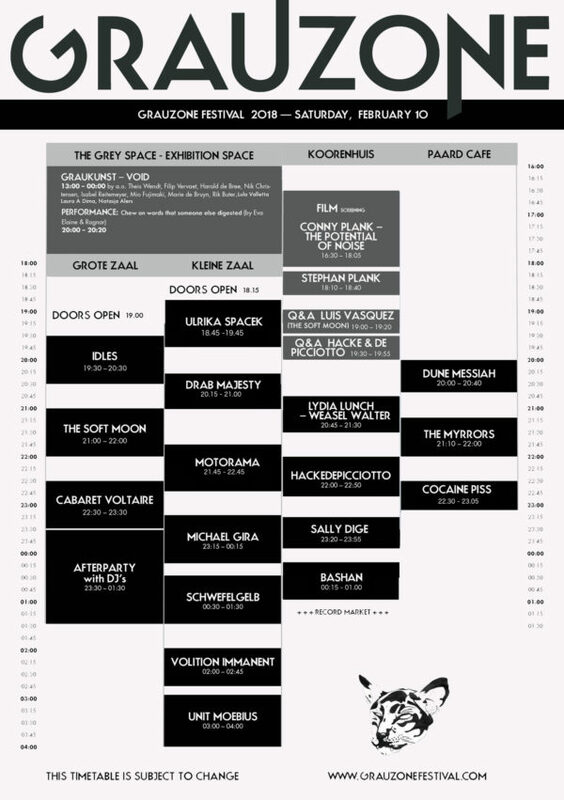 GRAUZONE Festival line-up is complete with: Bashan, Cabaret Voltaire, Cocaine Piss, Deidre Direktor, DJ Manos Simotas, Drab Majesty, Dune Messiah, Hackedpicciotte, IDLES, Knekelhuis, Lydia Lunch, Michael Gira, Motorama, Parrish Smith, Sally Dige, Schwefelgelb, The Myrrors, The Soft Moon, Ulrike Spacek, Unit Moebius, Volition Immanent. The multidisciplinary underground festival- with bands from wave to psych takes place for the second time at Paard and Prins 27. This year, there will be more locations including The Grey Space in The Hague and Paard Café. Grauzone festival also features a symposium, a filmprogram, an exhibition and a recordfair. To enter Grauzone, get a wristband at the cash deck at Paard. Click here for the online timetable. Pioneering industrial and electronic, Cabaret Voltaire were a huge influence on commercially successful bands such as Depeche Mode, New Order, Ministry, Marilyn Manson and Nine Inch Nails. At Grauzone Richard H Kirk will play an exclusive set with new material. Michael Gira is the legendary frontman and mastermind behind the iconic experimental post punk/post rock band SWANS. Gira is the creator of some of the most intense, darkly poetic music ever to emerge from the States. At Grauzone Gira will perform an intimate acoustic show. Angry (post)punk five-piece Idles from Bristol are one of the most exiting British bands right now. Their 2017 debut album ”Brutalism” is named as one of the best albums of the year by BBC Radio and many others. IDLES are known for their intense live shows and they always play like their lives depend on it! Russia’s Motorama combines cold wave, indie and postpunk. This year, they released their fourth album ‘Dialogues’. For fans of hooky guitars, dreamy intense dark vocals it’s a must-see. Bashan is the solo project of Savages guitarist Gemma Thomson. In October 2017, Thomson released her first EP on which she experiments with guitarsounds, soundscapes and creates a droney, dark sound. Berlin duo Schwefelgelb mix body music with techno. This year they released a new record that is going viral all over the world and played by dj’s like Helena Hauff, Front 242 and Silent Servant. Also on the billing is Drab Majesty, a dark wave duo from Los Angeles that mixes dreamy post-punk, wave and synthy sounds. Danish neo-folk trio Dune Messiah, influenced by Leonard Cohen, Nick Cave, Current93 and Death in June, brings you in their world of neo-folk, dreamy songs with sharp guitarriffs. The Soft Moon is one of the most popular wave/post-punk bands at this moment and will present their fourth album ‘Criminal’ which will be released a few days before Grauzone! No Wave/post-punk legend, singer, writer, poet and actress Lydia Lunch will give an exclusive performance with Weasel Walter. as “Brutal Measures”, a longform composition featuring tense spoken word versus manic free drumming outbursts, glued together by cryptic electronics. She’s known for her intense performances and collaborations with artists like Nick Cave, Sonic Youth and Michael Gira/Swans. Belgium punks Cocaine Piss always play an energetic, aggressive show and already performed at festivals like Pukkelpop and Dour. In 2016 they released their album The Dancer which was recorded by legendary producer Steve Albini in Chicago. Arizona’s psych desert rock band The Myrrors, started in 2008 and just released their fourth album ‘Hasta La Victoria’ in 2017. Popular Post -punk shoegaze band Ulrike Spacek, were the highlight of Eindhoven Psychlab and played festivals like Best Kept Secret, Le Guess Who and London Calling. Berlin-based Canadian Sally Dige is known for her dark yet highly danceable electro-pop songs. Dutch electronic sounds come from duo Volition Immanent Parrish Smith and Knekelhuis’ Labelboss Mark Van de Maat. They mix EBM, Body Music and Techno reminiscent of acts like Nitzer Ebb and Front 242. Unit Moebius, pioneer of The Hague electronic acid house will play a live set. They influenced many electronic bands with Aphex Twin as their biggest fan. At the pre-party, Berlin producer and DJ Manos Simotas, also known as UNHUMAN, will play an exciting EBM, industrial set. New Yorks DJ ‘Deirdre Direktor’‘ plays a mix of electro, wave and techno.